During the process of pulling together the website, I realised that I didn’t have many images of Brisbane. So, in order to do this fine city proud, I have kicked off a personal project called “Seen On George Street”. How sweet it was this morning, to find a little bit of Vegas in Brisvegas! 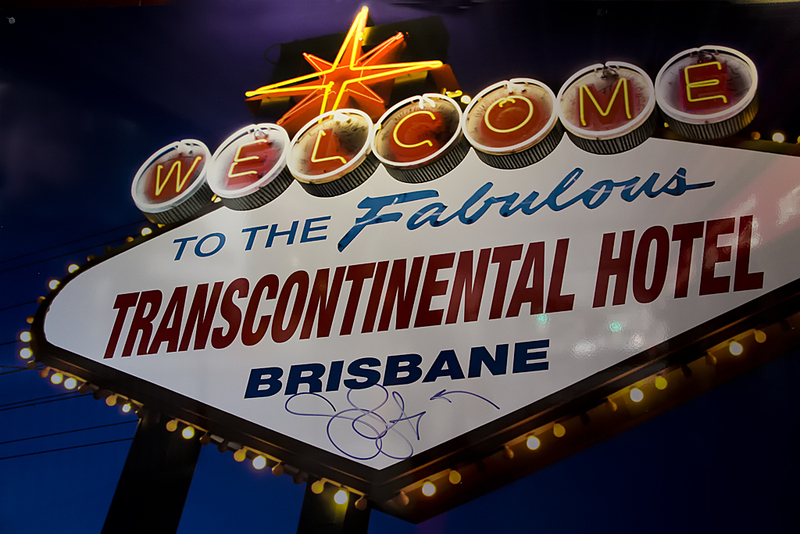 The Transcontinental Hotel on George Street is quite an interesting place and is frequented by backpackers, tradies and shady detectives! I thought it might be fun to go through my own crop of 2012 photographs and identify 12 images which not only stacked up technically, but resonated the most on a personal level for me. With the launch of Getaway Images and establishment of the website this month, the challenge for me going forward, is to step up, and improve the quality of my images. This first batch of favourites sets the standard. By the way, I love challenges! So, in no particularly order, here are my favourite images from 2012. 1. Winter in Wyoming. 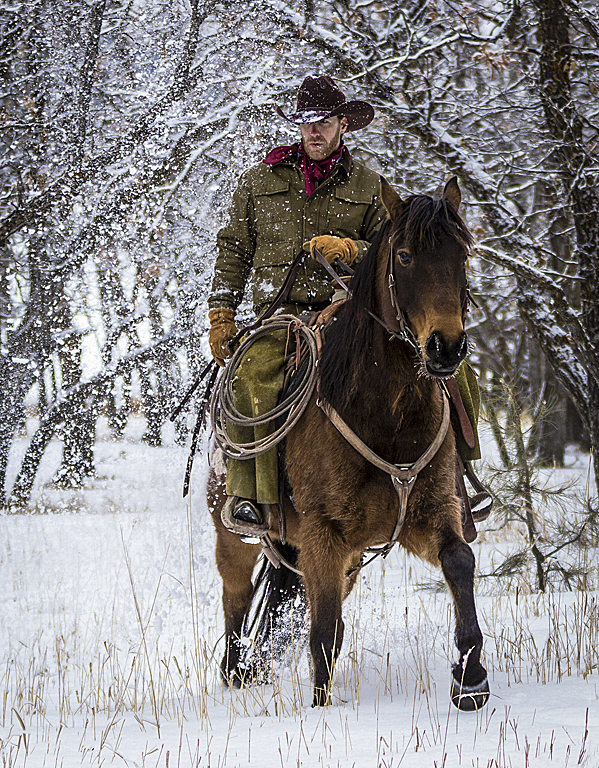 After spending two hours in a pickup truck travelling with cowboy Tommy from Spearfish in South Dakota to New Haven Ranch in Wyoming, I definitely had to include a shot of Tommy. This image was awarded a Silver Award in the 2012 International Loupe Awards in the Portrait category. 2. Paint Pony. I created this using a slow shutter speed in camera. 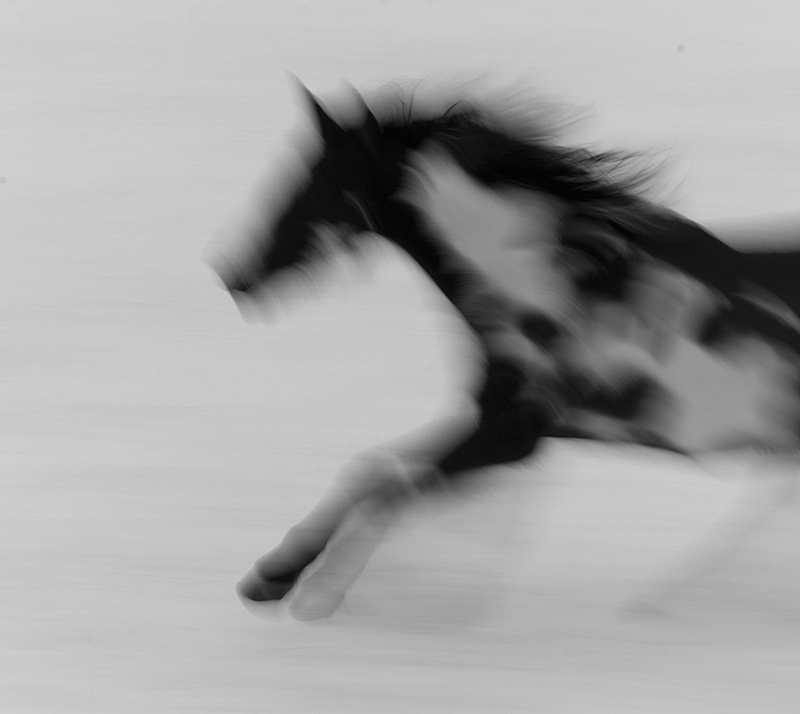 I must admit, at the time, my heart was thumping as the horses galloped across the snow covered fields towards me. “Stay still, stay still, they will go around the truck” said Les…..and they did! 3. Media Man in Trouble. 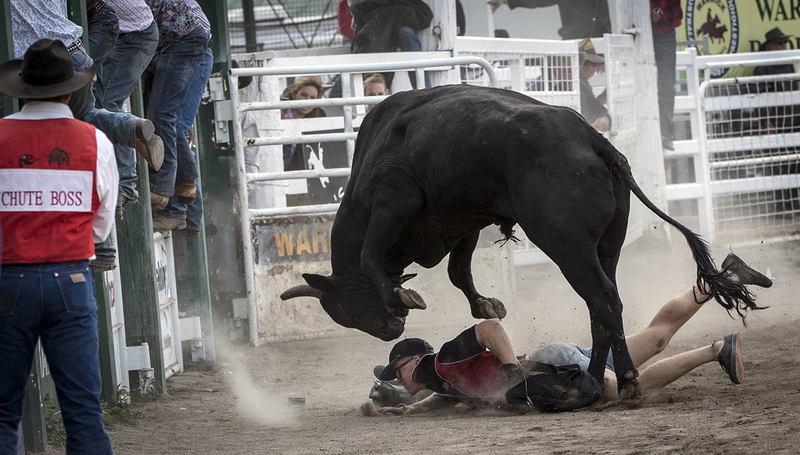 Warwick rodeo has to be one of the best rodeos in Australia! The showground rails are lined with photographers, all jostling to try and get the best action shot. This particular image was taken after the lenses had been put down and the action had finished, or so we thought! The last bucking bull was on his way out the gate, the clowns had finished their job protecting the cowboy, the media man was worried about his next piece of video, and the announcer was reading up on the next event. One bull, who wasn’t required, was let out of the chute and expected to go straight out the open gate and join the others. Not so, he saw an opportunity, and down went the media man! By the way, the media man was OK. He jumped up, dusted himself off and was was not hurt at all. Not sure about his equipment though! 4. Sedona Red Rocks and Winter Snow. 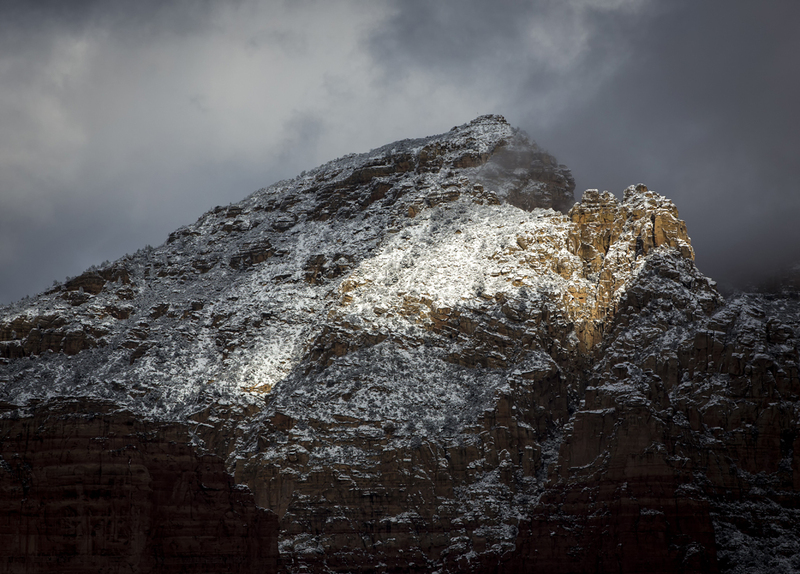 I was told by the locals that it only snows in Sedona around five times a year. Not only was I able to attend a good friend’s wedding which was an awesome event, but struck the jackpot with the snow. Sedona in Arizona, is one of the most beautiful towns in USA. Surrounded by incredible red rocks, the vibe is very chilled, the southwest food is to die for, and the landscape is simply stunning. A trip on the Verde Canyon rail was another memorable highlight. 5. Sedona Abstract. Sometimes you just see things! 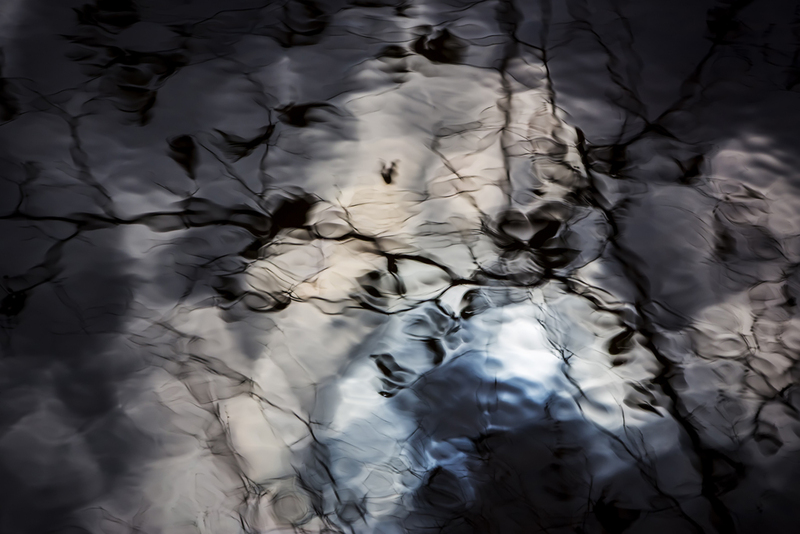 I was watching the wind create ripples in the river behind Los Abrigados Resort in Sedona. It was an overcast day, except for one small break in the clouds where the blue sky was pushing through. This is the reflection of the blue sky and the trees in the water. 6. Cyprus Dome Reflections. 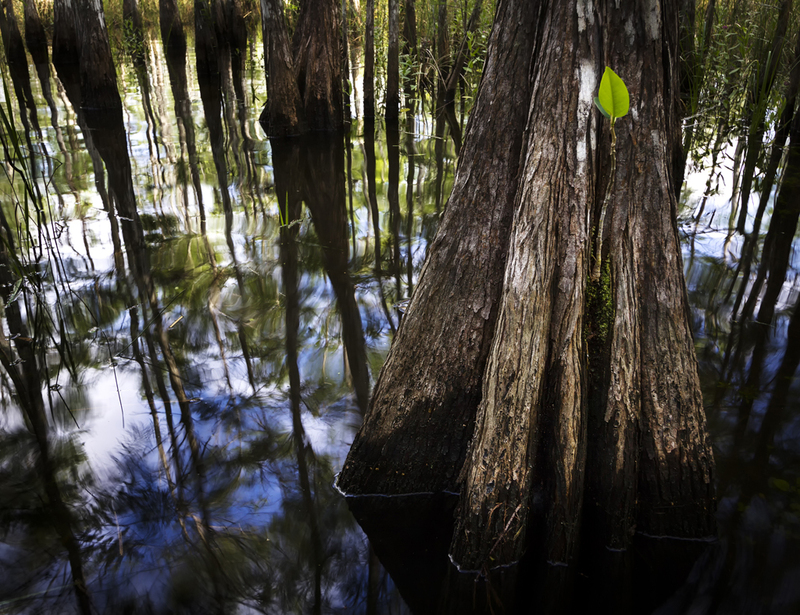 One of the most magical experiences for me last year was the time I spent exploring The Everglades in Florida. From the road, the cyprus domes resembled unremarkable groups of trees in the middle of the sawgrass plains. But once you stepped inside, wow and double wow, the magic was mind blowing! Beautiful orchids, massive cyprus tree trunks, herons wading, and the most beautiful reflections were present as the sun peeked through the canopy. No gators were home on their nest on that wonderful day…… thankfully! Robert Chaplin, awesome Everglades guide! 7. 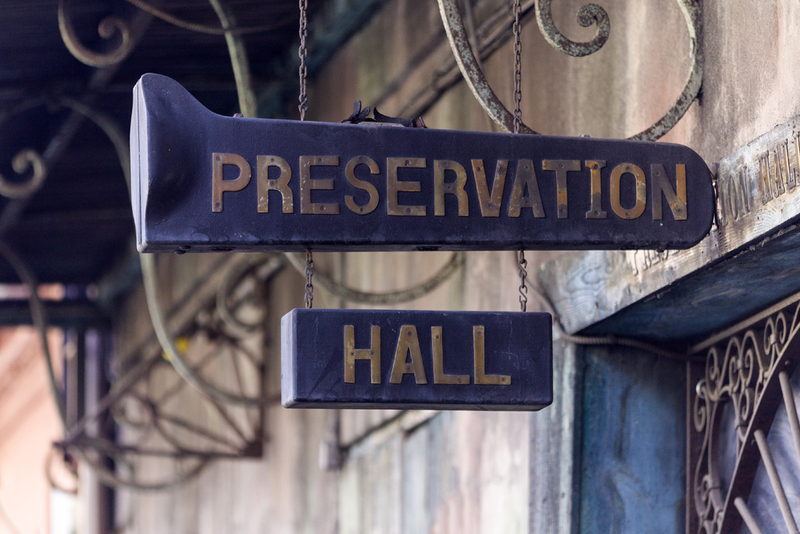 Preservation Hall. I was fortunate to visit New Orleans in February 2012. Sadly, more than seven years later, parts of the city are still severely damaged and major buildings have yet to be repaired. Hospitals remain closed and the Lower Ninth Ward is like a ghost town, peppered with odd colourful buildings being rebuilt with the help of celebrities such as Oprah and Brad Pitt. It is quite sobering to still see the visual paint marks on homes denoting who has searched buildings (rangers/police) and numerals representing the number of deaths that occurred in that particular building. Luckily, the amazing architecture in the French Quarter was spared. One of the iconic jazz joints is “Preservation Hall” where you have to queue up for hours to hear the old guys strut their stuff. If you visit New Orleans, don’t miss the beignets and coffee and chicory at Cafe Monde, epic stuff! 8. 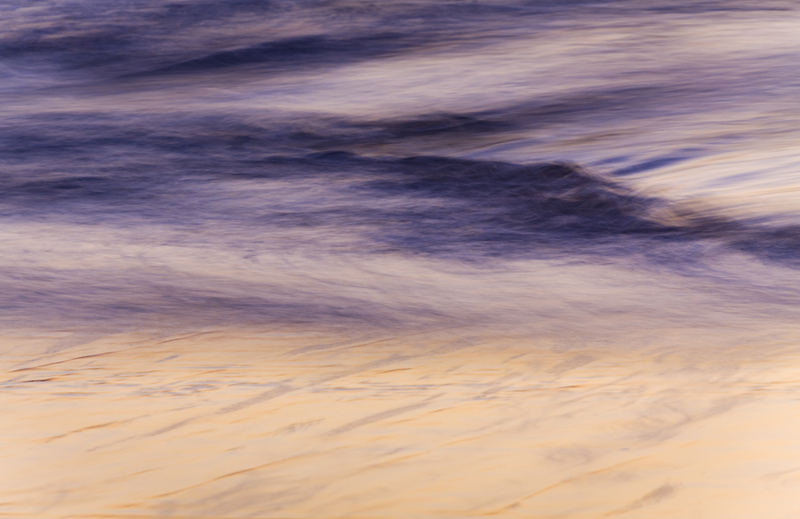 Coolum Abstract. 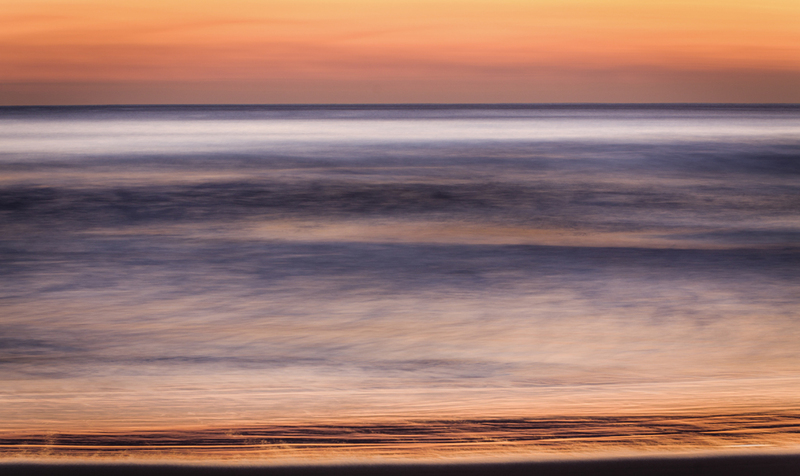 One of my favourite things to do when the sun breaks the horizon and heralds a new day, is to watch for light reflecting on the ocean or on the sand….pure magic! Mental note, more abstracts to capture this year! 9. Trent’s Sunrise. My usual weekend seascape routine involves getting up early and driving an hour up the coast to catch the sunrise. Often I arrive a little early and sit in the car until it is light enough to see where I will be going, and use the time to check emails and Facebook on my phone. On this particular morning, Facebook was in meltdown! Friend and awesome marathon swimmer, Trent Grimsey, had swum the English Channel and smashed the world record for the fastest crossing…. 6 hours 55 minutes. Back in Australia, mother nature put on an epic sunrise to celebrate….onya Trent! As a swim mom, you know the hard work the distance swimmers put in and fully appreciate the support network they need from their family to succeed. 10. 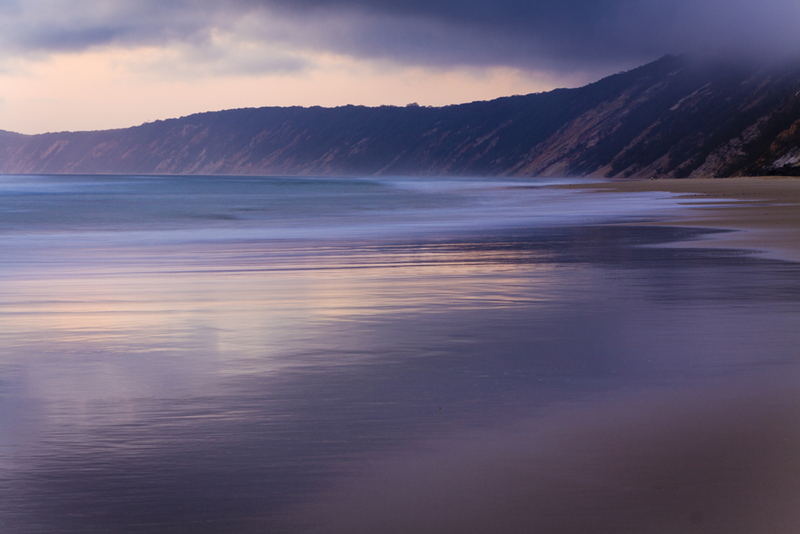 Rainbow Beach Sunrise. What can I say, one of the most beautiful places on the Sunshine Coast. I just love the light skimming across the sand and water. I definitely will be heading back up to this little gem of a place again this year. The Rainbow Beach Hotel is good for a quality pub meal and a glass of wine! 11. 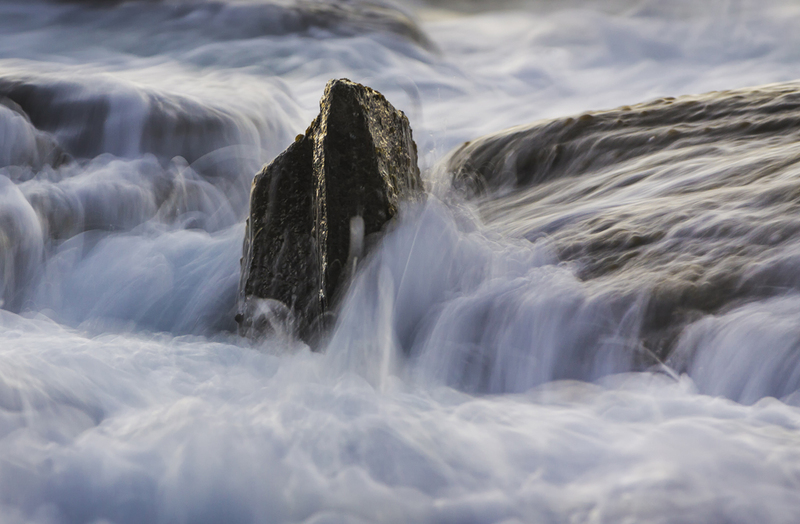 Solitary Rock. I have many images of Point Cartwright on the Sunshine Coast, but this has become one of my favourites. I love how it is possible to isolate part of the landscape so it’s place of origin is no longer obvious. 12. 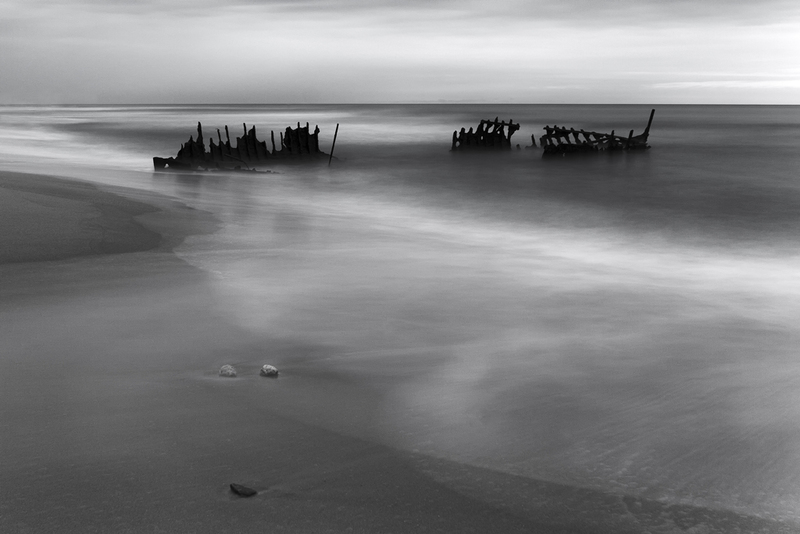 Three Pebbles and a Wreck. The SS Dicky is one the most photographed icons on the Sunshine Coast. Fingers crossed that the latest round of storms do not cause any further damage to the wreck. Here’s hoping that 2013 will be another epic year of memorable experiences. A trip to New Zealand is currently being planned for April, an outback Australia journey in August/September is also on the bubble, plus lots of weekend trips around South East Queensland will be sure to keep me busy!